The statistics with divorce are astounding. Money is a known root of cause for many divorces. Even knowing that, post-divorce personal finance is still not discussed enough. 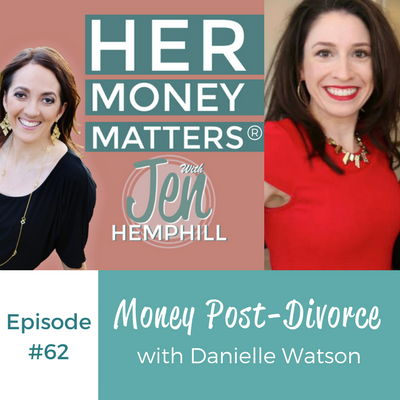 In this episode, Danielle Watson shares her story of taking charge of her personal finances after divorce. What was your takeaway from this episode? Be sure to share your thoughts in the comments below. [00:00:25.9] JH: Hello, hello. I am yet back for another episode this summer day in August and hopefully that you are in a cool place while listening to this episode. I would love to connect with you outside of this microphone and in our free Facebook community. If you haven’t already joined us, go to Jenhemphill.com/community. I ensure you it’s fun and of course, if you don’t enjoy the vibe, you can always leave. No biggy, no feelings hurt. So this month as you know, or if you haven’t been listening I will let you know that we are focusing on the different life situations as it relates to money. So last week, we spoke about special needs finance and this week, we are tackling divorce and the statistics of the number of divorces is definitely astounding. It is nothing that anybody is surprised about. We know about this, right? But one thing that is not talked about enough is personal finance after divorce. There are so many different scenarios after divorce. You may not have ever touched the finances or maybe you were the one in charge, there can be debt, the list goes on. Divorces can be easy, divorces can be like a nightmare. There’s just so many different scenarios. So today, our guest shares her story. In today’s episode, we’ll get to know besides about her story of divorce we’ll also going to get to know Danielle. In today’s episode, you’ll learn why she hid when she was little when her mom was in the grocery checkout line. You’ll also going to learn the surprise she got hit with as she was going through the divorce and you’ll going to learn the best money advice she has received and how it translates to her current spending. So let me share with you a little bit about Danielle Watson. Danielle Watson is the world’s most unlikely anthropologist — I attest to this — a professional muse, and a TEDx speaker. Danielle’s uncommon mixture of infectious enthusiasm, unconventional ideas, a spectacular smile have made this pint size lady a popular inspiration to a global audience of choose your own adventurers. So let’s go ahead and meet Danielle. [00:03:08.0] JH: Welcome Danielle to the Her Money Matters Podcast. I am pumped to have you here. [00:03:12.5] DW: Thank you. It’s a pleasure to be here Jennifer. [00:03:14.8] JH: Well it is nice to have you on the show. Well, one it’s also nice that I’ve actually connected not just online but in person. We have met, we’ve even had lunch together so this is going to be a good interview to really get to know another aspect of you, your money story and the life change that you have encountered throughout your journey in life. So I am excited to do this. So are you ready to dive into the questions? [00:03:45.4] JH: Perfect. So I want to start off with just learning more about your personal money story, how you grew up around money. [00:03:53.5] DW: Yeah, so like a lot of our listeners I’m sure I grew up hearing that “money doesn’t grow on trees”, “we don’t have money for that”, “it’s not all about you” when I would ask for something and I couldn’t have it. But I have one very clear specific memory from when I was probably about seven or eight years old. I remember going to the grocery store with my mom and seeing the woman in front of us have to put away some of our items because she didn’t have enough money for them. And somehow, putting that together in my mind that that was embarrassing for her and realizing that my mom was often telling me that we didn’t have enough money for things and from that point on until I was probably a teenager, whenever I would go to the store with my mom and we would go to the checkout, I would go find somewhere else to be because I didn’t want to be standing there next to her when she had to put some of her items back. It never actually happened but I developed that fear just from witnessing how other people dealt with their money and from the influence of what I was hearing at home. [00:05:13.8] JH: Interesting. So when you grew up and you became independent, let’s say you went to a grocery store, tell me how did that affect your shopping process? Were you very diligent as to what you have budgeted or tell me a little bit about that? [00:05:30.0] DW: You know it’s interesting, I actually went the opposite way. So from a young age, I decided I was going to get an advanced education. I was always going to have the money for what it was I wanted and I was not very conscious about what I spent my money on and so the first thing I did when I turned 18 was I got myself a credit card so that I would always have that little backup if I didn’t have enough money to pay for whatever it was that I needed. [00:06:05.5] JH: Got you. sSo you said it had the opposite effect and did you find yourself becoming more of a spender? [00:06:14.0] DW: Absolutely, yes. Absolutely a spender. [00:06:18.1] JH: All right and did you also find yourself racking up credit card debt or not even to that extent? You mentioned that you had it as a backup. And then there was a period of time where I wasn’t working. So I fell into that scheme of the robbing Peter to pay Paul basically. Where I would take a cash advance from one credit card to be able to pay the other credit card and vice-versa and I racked up a whole lot of debt. [00:07:18.3] JH: Crazy, crazy and then let’s fast forward a little it or I don’t know how much longer we’re fasting forward but you got married. [00:07:29.4] JH: And then recently you had a life change. Can you tell us about that? [00:07:35.1] DW: Yes so recently, I have been through divorce and I was with my husband by the time I was 19 and we lived together from the time I was 20 and he was the one that really managed the finances. So I am 37 now, so it’s a long time and finances were a lot different back in the 90’s for the little bit of time that I managed them and when you’re 19-20 years old things are a lot less complex. So being faced with divorce and then being faced for the first time with being responsible for my own finances and investments and 401(k)’s and all sorts of things was extremely overwhelming on top of the stress of divorce. [00:08:24.5] JH: I can imagine. So during when you were married, he managed the finances you didn’t have anything to do or deal with them and did you all have any money conversations or were you aware of what was going on, what was going in, what was going out in terms of finances? [00:08:44.7] DW: Reasonably well. I had a handle on roughly how much we had and what things costs. If you’d ask me what do we pay in the summer for air conditioning bill, I could have said well anywhere between 50 and $300, I’m not really sure. [00:09:00.9] JH: But you had an idea. [00:09:02.0] DW: Yeah, I did have an idea. [00:09:04.0] JH: Okay, perfect and so when you became divorced even though you didn’t managed the money during the time of your marriage, how much of an impact did that have on you when you just were on your own? So once I had that in place I felt a lot more at ease, a lot more relaxed. Okay, these things are going to be done and then I just need to be looking at them going okay, where can I put more and where do I need to put more in, where do I need to put less? But that comfort of knowing, “Okay, I’m not going to get in trouble,” was huge. [00:10:18.1] JH: Right so automation was a huge part of how you managed, started managing your finances on your own and that is a huge time saver and stress saver and all those things combined and what other changes did you have to make? [00:10:36.7] DW: You know, I really have to give my husband some props here, my former husband. He was so generous to give me some education on how he’d done things and provide me with some of the spreadsheets and things I’d been used to seeing around the house. So even though I didn’t quite know how to use them right away, he did provide me with that to sort of help me along the journey and what else changed for me? Oh my goodness, well everything. Having to figure out I have to get my own cellphone bill now, how much can I afford to spend on groceries, what should it cost me for this or that? I have no idea if what I’m spending on water every month is reasonable or not. So just having to get with other people in my life and get an idea of what they spent and how they managed their money. I just had to ask a lot of questions. [00:11:35.8] JH: Okay and what was the best advice that you got from them? [00:11:39.9] DW: Oh my goodness, the best advice was probably do what you need to do for yourself first. So keep doing the things that you need to do for your sanity. Like it would have been so easy for me to cut out my yoga studio membership fee because it’s a hefty chunk but if I didn’t have that place to release my stress and to take care of myself, I might not have been able to keep up with the other things I needed to do to make sure that I was continuing to make money. [00:12:16.3] JH: Make sense, I really, truly believe you definitely have to take care of you because I know as women, we feel all sorts of guilt when it comes to spend money on ourselves. Money can bring so much emotion as you mentioned and I think you’ve got to do take care of you definitely first. I mean I realize that there’s bills and stuff but you have to incorporate taking care of yourself. So I am glad that you brought that up and in your experience with the divorce, what would you say is one thing that you wish you had known? [00:12:56.1] DW: Going through the process and having an attorney and having her go over all of our finances with a fine tooth comb, I have to say I felt very fortunate and lucky that my former husband had been transparent about all the finances that weren’t hidden things going on. We didn’t find any surprises, there were no secret accounts and my attorney was frankly shocked because she’d been doing this a long time and she could count on one hand how many times she hadn’t found something that wasn’t on the up and up. So I was very fortunate that I didn’t experience any sort of surprises but I think that if you feel like life might be going that way or you do get hit with that, that’s something to prepare for and to certainly go looking for because people do shady things unfortunately. [00:13:55.4] JH: Yes, right. Well that’s wonderful because it sounds like you have one of those stories as far as the divorce, unlike most divorces that your attorney said that there’s some hidden, some surprises, some extra debts or maybe — I have heard or seen so many different things of all the sudden, one of the spouses being affected with a lot of debt because they didn’t know that debt was taken out in their name, just so many things. So that is amazing and that’s great that you didn’t have to go through that and props on your former husband. So that’s great and what would you say you do well with money? [00:14:43.2] DW: I am really good at finding places that I want to spend it. [00:14:48.5] JH: Tell me about that. I want to hear this. [00:15:21.6] JH: I love that, you’re thinking terms. I was curious where you’re going with that because I always talk about when I coach and even on my podcast here, I always talk about how every dollar should have something to do, that you can’t leave any lingering money in your account without having a job or something to do because if you don’t assign it something to do, it just disappears on its own. You’ll end up spending it before you know it and I love your giving spirit there. I mean you think about others when you have that extra money and how you can help and that’s a beautiful thing. I absolutely love that. [00:16:04.5] JH: And tell me a little bit about your best money spent. So we talked a little bit about what you do well with money and how about what has been your best money spent? [00:16:17.9] DW: Oh my goodness, there are so many things I have spent money on that have thought me incredible lessons. Some of the best money I think I have ever spent was spent on a business coach. Somebody to help me figure out what the heck it was I wanted to do with my business. I invested so much money with her that I was scared to death that I would fail and I was willing to do anything to succeed and that money motivated me to no end knowing that I was paying her those big bucks. [00:16:53.9] JH: I believe that. [00:16:55.2] DW: It made me break through every barrier. [00:16:57.7] JH: That is definitely no doubt about that. I love that and how about do you say you would use more cash, check, credit, what is your favorite way of paying? [00:17:10.5] DW: I like to pay with my credit card or my debit card. I have been playing a game with myself recently with getting more comfortable with having cash in my wallet. When I was 18 or 19 years old, I was actually mugged and even though I didn’t have a lot of cash in my wallet, I had already been uncomfortable having cash in my wallet and then after that happened, I was even more uncomfortable having cash in my wallet and now, I am just trying to get over that and be more comfortable with it. Especially knowing that I am on my own now, just never really knowing having $20 bucks in my wallet would get me out of my situation. So definitely getting more comfortable, working on keeping a $100 on there, still not very comfortable with that. [00:17:58.5] JH: Well sometimes it’s just a work in progress because I know a lot, and I don’t like carrying cash and I don’t know. I still have to dig as to why. I know a part of it is just because I feel like if it’s there, I just spend it and it doesn’t have to be accounted for. I don’t know why, that’s just how my brain works. I know that’s a part of it but I know many times it’s been recommended to me that you need to have, like you mentioned, a $100 or something in your wallet for just in case there’s some situation that your credit card might not get you out of and you just never know. So you definitely bring up a good point and a good reminder that I need to think about that again for me as well and would you say you’re a saver or a spender? [00:18:50.4] DW: I would say I’m a spender for sure. [00:18:52.7] JH: And what kind of things do you like to spend on? Because I know you mentioned you’re definitely a giver but what other things, and yoga classes, but what are some other things? [00:19:04.4] DW: Yeah, if you were to look at where does my money go, it goes mostly to things for myself, self-care specifically. So whether that’s yoga, getting a massage, having my hair cut. The other place it goes to is food. I really like to eat and I like to eat good food whether that’s at the grocery store or going out, if you were to look at my grocery budget for one person, it’s probably quite a bit more than would seem reasonable because of the sorts of things that I like to eat. [00:19:38.3] JH: No, I don’t blame you. Food is a good thing because you also like to cook. [00:19:45.8] JH: So I don’t blame you, food is a good thing and anything else you’d like to spend on? [00:19:56.0] JH: Wine, food, and self-care, love it and how about what is your proudest money moment? [00:20:07.0] DW: My proudest money moment was the first time someone handed me a five figured check. [00:20:16.3] JH: Ooh love it. Tell me a little bit about that, what went through your mind and all those things? [00:20:23.1] DW: Two things went through my mind. One, that all the investment I’d made and becoming the person that I wanted to become had paid off because there was not just social proof but monetary proof that I did have something to offer and that I had organized it and I had made it available for purchase. But the other thing I felt was so excited for the person who had given it to me because she had made a decision about what she wanted for herself and I knew that I could deliver that for her. I knew that on the other side, she was going to have this amazing result and go through this process of transformation that would serve her for the rest of her life and that was just an incredible high that lasted for days. [00:21:12.6] JH: I bet, and I know that you know that this podcast is about making money simple and simply taking control of it so how would you finish this sentence: Her Money Matters because _____. [00:21:30.3] DW: Her money matters because us ladies are making most of the purchasing decisions in this country. So the more financial consciousness we have, I think the better place the world will become. [00:21:45.9] JH: Very, very true statement because all those big bucks that the big companies are spending on advertising are targeting us women. [00:21:55.8] JH: Because we do make those decisions so I completely agree, I love that statement. I appreciate you so much joining me today. You’ve shared so much stuff, so much good stuff and it’s been a blast talking to you. [00:22:08.5] DW: Thank you Jennifer, it was my pleasure. [00:22:12.8] JH: Well that was our chat with Danielle and I’m sure you probably felt through the microphone and in your earbuds her smile, right? Because she’s just very enthusiastic, she’s very energetic and I’m sure you sensed that as much as I did. So I did have a couple of take aways that I want to share with you and if you any take aways from these interviews or even just from a solo episode, share with me by all means. E-mail me, join the Facebook group, whatever you have to do, I want to hear from you. So before I share my couple of take aways, I as usual, do a weekly shout out. I recognize someone and today I wanted to recognize Breena. She is a part of our free community and literally just a breath of fresh air, no joke. She is in there supporting others, she’s asking questions, she’s sharing blog post and you can tell she’s taking action. So Breena, keep it up lady. I love what I’m seeing. So let’s talk about some key take aways that I have from my chat. The one was her abundance mindset. It was just unreal for me. She feels it all through her bones. I don’t know how else to explain it, if that’s a great way to explain it but her abundance mindset is more than a 100%, right? And notice that when she said she’s a spender, notice how she spends is very diligent not only on what she spends but also her thoughts on when she spends. You noticed that right? So if you’ve missed that, go back to that piece of the interview because it’s very, very important. I think that’s very, very helpful. It’s like she’s spending with intention, right? And she is very diligent not just on what she spends but also on what she’s thinking. She’s very aware of her thoughts of when she spends. So I thought that was awesome and then the other part that was a big take away was her divorce. It was not the typical nightmare divorce that you hear about all the time, right? So that was just so refreshing to hear that because really, I have not experienced a divorce so I can’t talk from that perspective, but what I do know is that there’s some things you can’t control but what you can control is you. Right? So I think however how the whole situation was with her, you can tell from talking, she’s very in tuned to herself, to her thoughts, to her feelings. She has that abundant mindset and I think that helped as well. Just my thoughts anyways. So that is a wrap for today. My invite still stands. If you still haven’t joined us in our free community, if you are a reserved person in the sense that you’re just very private with your money matters, by all means join us and lurk around. That is completely okay. I’d rather you lurk around, not say anything and get value from the conversations that happen there than not join us and not gain that value. So next week on the podcast, I introduce you to a big hearted woman who shares her story of tragically losing her husband and her having to pick up the financial pieces afterwards. I want to thank Danielle for joining us, for being just amazing and sharing your story. So be sure to check out the show notes on where to find Danielle and more at Jenhemphill.com/62. So thanks again for joining me and I’ll talk to you next Thursday.